The pituitary gland, also known as the hypophysis, is connected to the hypothalamus of the brain by a tiny isthmus of nervous tissue called the infundibulum. It sits within a small cavity in the sphenoid bone of the skull known as the hypophyseal fossa. Thus the sphenoid bone surrounds and protects the delicate pituitary gland from damage by external forces. While the pituitary gland has previously been considered to be a single structure in the body, further study of its structure has revealed that in fact it is made of two structurally and functionally distinct regions. The anterior pituitary gland or adenohypophysis is a true hormone-producing gland made of glandular epithelium. 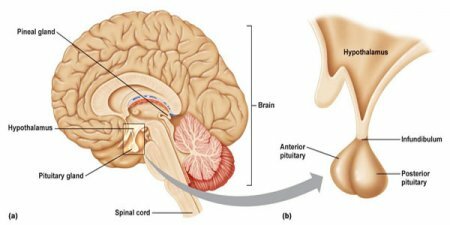 The posterior pituitary gland or neurohypophysis is an extension of nervous tissue from the hypothalamus that stores and releases two hormones produced in the hypothalamus. Surrounding the pituitary gland are several important blood vessels that support its tissues and transport hormones. The superior hypophyseal artery provides blood flow to a bed of capillaries surrounding the hypothalamus and the infundibulum. Releasing and inhibiting hormones produced by the hypothalamus are secreted into this capillary bed and carried by the hypophyseal portal veins to the capillary bed surrounding the anterior pituitary. These hormones are used to control the output of hormones from the anterior pituitary. From the capillary bed of the anterior pituitary, blood – including any hormones secreted into it – is returned to the heart and the rest of the body via the anterior hypophyseal veins. Blood to the capillaries surrounding the posterior pituitary gland travels through a separate network via the inferior hypophyseal artery and is returned to the heart by the posterior hypophyseal veins. The anterior pituitary gland produces seven important hormones: human growth hormone (hGH), thyroid-stimulating hormone (TSH), follicle-stimulating hormone (FSH), luteinizing hormone (LH), prolactin (PRL), adrenocorticotropic hormone (ACTH), and melanocyte-stimulating hormone (MSH). Each of these hormones targets specific receptors in the body to stimulate specific glands and tissues in the body. The thyroid gland, ovaries, testes, mammary glands, and the cortex of the adrenal glands are all stimulated by the hormones of the anterior pituitary, resulting in the pituitary gland being known as the “master gland” for its control of the endocrine system. More modern studies now show that, while still important, the anterior pituitary is subservient to the control of the hormones of the hypothalamus. Releasing hormones from the hypothalamus, such as thyrotropin-releasing hormone (TRH) and gonadotropic-releasing hormone (GnRH), stimulate the anterior pituitary to release TSH, FSH, and LH. Inhibiting hormones, such as growth hormone-inhibiting hormone (GHIH), prevent the secretion of hormones hGH and TSH.